With the global marketplace for sustainability materials estimated to reach $529 billion by 2020, securing a strong place for wood is essential to the wood products industry's future growth. That means both telling the positive story of wood's renewable, energy efficient advantages, as well as defending against anti-wood bias in rating systems. Strong, unified industry support is essential as the sustainability battlefield continues to spread from the state to the federal level. More attention is being paid than ever before to how buildings impact the environment, including the choices of materials used in construction and how those materials help conserve energy during operation. Wood is the perfect sustainability material because it is renewable, stores carbon that reduces greenhouse gases, and is energy efficient. Winning acceptance for wood is a challenge, however, as competing materials and certain environmental groups seek to control the U.S. sustainability market. Additionally, some sustainability rating systems, such as the U.S. sustainability Council's well-known LEED rating system, contain scientifically indefensible biases against wood and many U.S.-sourced wood products. LEED is aggressively seeking a government-sanctioned monopoly on rating systems which would seriously harm the use of U.S. wood products. Served on the Green Globes and National sustainability Standard Committees, assuring wood products are rewarded for their environmental characteristics and positive contributions. The North American wood products industry is committed to sustainability in its products and their use. In support of this commitment, we are pleased to share third-party verified Environmental Product Declarations that describe the environmental performance of many of the products we produce. 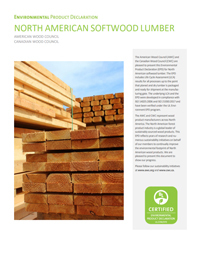 The American and Canadian Wood Councils have partnered with Building Materials Reuse Association (BMRA) to develop a North American directory outlining reuse and recycling options for wood and wood products. The online resource lists companies within a searchable geographic area that have agreed to provide reuse and recycling options for wood and wood-based products, for both those looking to provide such products as well as those looking to obtain wood products for reuse. Athena Sustainable Materials Institute has released an update to the Impact Estimator for Buildings, a popular life cycle assessment (LCA) software package for building designers. Changes in this version include insulation and window updates, and adjustments to align with the latest US EPA impact characterization method and with emerging European standards for building declarations.